You know what makes a perfect present for toddlers? $6.5 million apartments in the luxest of luxury buildings in New York City. 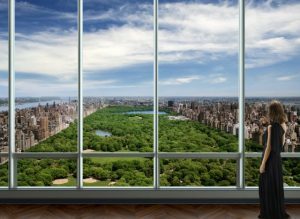 That was the rationale an unnamed Chinese buyer had when she picked up a condo for her baby daughter at Extell Development’s One57 on West 57th Street, the Telegraph reported. And you thought NYU students right now are annoying. Amenities at the Christian de Portzamparc-designed building include 24-hour doorman and concierge, private dining and function room, full catering kitchen, library with billiards table and 24-foot aquarium, screening room, gym, parking space available for purchase and a pet wash room. Granted, $6.5 million is pretty small platinum potatoes for a development that boasts a record-breaking $90 million sale of a duplex penthouse on the 89th and 90th floors. However, cut the new owner some slack — she’s only two, after all.